Dr. Seuss has held an important place in my life, stretching from my own childhood and into parenthood, and connecting the dots between the pure joy of reading and powerful messages keeps him at the top. So what fun to discover the story, species and science behind the inspiration for his most impactful books! In 1970, millions of people observed Earth Day for the first time, and the Environmental Protection Agency was born. Joni Mitchell’s “Big Yellow Taxi” topped the charts. And in La Jolla, Calif., Theodor Geisel, also known as Dr. Seuss, was fighting to keep a suburban development project from clearing the Eucalyptus trees around his home. But when he tried to write a book about conservation for children that wasn’t preachy or boring, he got writer’s block. At his wife’s suggestion to clear his mind, they traveled to the Mount Kenya Safari Club, an exclusive resort where guests watched animals along Kenya’s Laikipia plateau. And if you haven’t guessed by now, it was there that “The Lorax” took shape — on the blank side of a laundry list, nearly all of its environmental message created in a single afternoon. 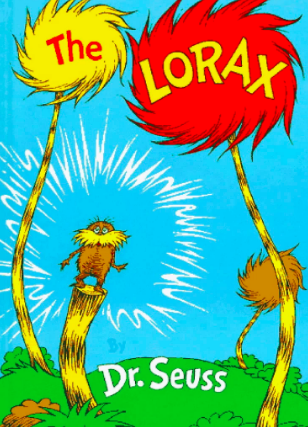 Despite an unsuccessful attempt by the logging industry to ban “The Lorax” in the 1980s, many have embraced the storybook as a critical tale about environmental policy, especially for children, ultimately heeding a hopeful message that future generations can save the environment by caring for it. But some have worried that Lorax, with his possessive use of “my” when referring to the trees and other creatures, isn’t really a good teaching model because he comes off as a self-righteous eco-warrior with an unfounded anger. In an essay published Monday in Nature Ecology & Evolution, the authors argue that the Lorax may not have been as bossy and ineffectual as he seems. Rather, the authors posit that Lorax may have been involved in a type of symbiotic relationship with the Truffula trees and his surroundings, threatened and defensive. The case for the Lorax’s Kenyan inspiration emerged after Dr. Dominy grasped for something to talk about at a dinner with Donald E. Pease, an English professor at Dartmouth College, praised for his lectures and biography on Dr. Seuss. And it evolved into a scientific process that including feeding the Lorax’s cartoon face into sophisticated monkey face-recognition software. Dr. Dominy, also a father, raised the topic of “The Lorax,” suggesting that the fuzzy, mustachioed protagonist of the book resembled the patas monkey, a fluffy, orange, real-life creature with a raspy alarm call that he had observed while working in Kenya. I highly recommend reading the entire article to the end to enjoy the humor in taking the real tools from biology and applying them without a hint of irony to the species search.